Back in the 1700s, one Tobias Smollett traveled from England to France and then Italy, and in the letters he wrote back home, he complained quite a bit about travelers' lodgings and the auberges (roadside inns) in France, finding them in general dirty, uncomfortable, and exceedingly expensive. (He was quite a curmudgeon, but many of his observations seem to remain relevant today.) These were not like tourist spots of today but rather simple stops along the road where travelers could get food and rest while exchanging horses for the next leg of their trips. Perhaps the most appropriate modern day equivalent might be the aires (or rest areas) along the French highways, and I'm afraid there is still some room for improvement 250 years later. These rest stops are run by private companies and typically feature full service gas stations, toilets, and a range of dining options, but I wouldn't describe them as terribly clean or inexpensive or of good quality. To be fair, this is generally true of rest areas in many places around the world. On the other hand, in 21st century France, one can still take care of private business in many of these aires standing up, using the simple but primitive hole in the floor! As for overnight accommodations, our experiences have been limited to Paris, Lyon and northern and eastern France, where we've stayed generally in teeny, tiny hotel rooms or generic hotel chain rooms and one condominium. Overall, comfort and exceptional cleanliness aren't at the top of the list of adjectives I'd use to describe these mid-range accommodations. (I know that there are many more impressive luxury holiday rentals, especially here in the South of France, but then we veer into a price range quite outside ours.) Within our budget range, we haven't slept on many comfortable French hotel beds or enjoyed sparkling and well-supplied hotel bathrooms. Sometimes the service seems a little begrudging too. Perhaps this is one reason that we choose to spend some of our holidays in Germany; we truly appreciate the gemütlichkeit (a German word denoting comfort, coziness, friendliness). We enjoy the friendly greetings and generous service, the airy down comforters and comfortable beds, and the exceptionally clean and bright furnishings. For our recent summer holiday earlier this month, we stayed within the German-speaking world, opting for Austria, with some side trips to Germany. In our limited experience, we unanimously award the gold medal for the best mid-range holiday accommodations...to Austria! We rented a holiday flat for a week, adding two days to our original agreement almost immediately when we realized that this was going to be an excellent stay. We had space, we had comfort, we had super clean windows, linens and floors, gorgeous petunias in overflowing flower boxes on our terrace, and a dishwasher that literally sparkled after its cycles. We had free bicycles for the entire week, free secure parking, free use of tennis courts, pingpong, and swimming pool. 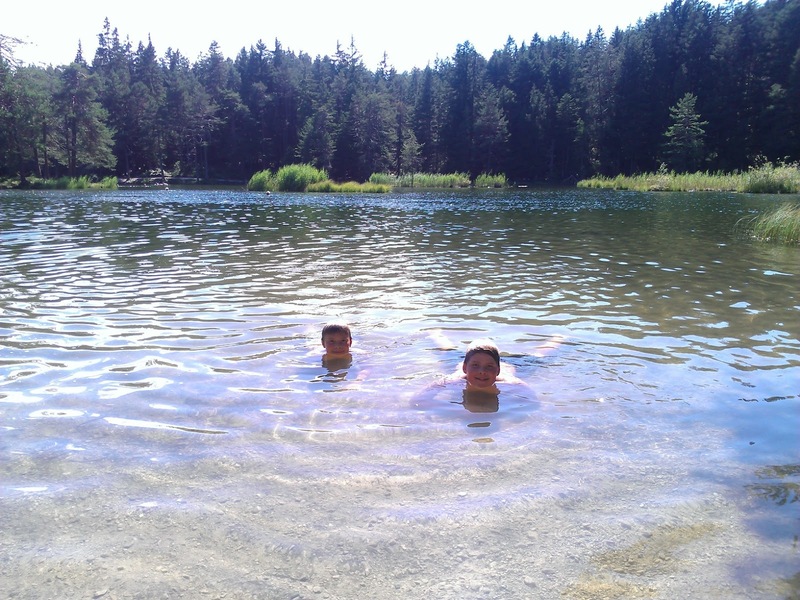 We had access to hiking trails and swam in an alpine lake not far from our flat and shopped in the nearby village. Fresh rolls were delivered to our front door each morning, and when we weren't eating in, we had some delicious meals for almost half of what we'd pay in France. (We did eat a lot of heavy meals, with meat and potatoes and apple strudel and beer, rather than the fresh produce we enjoy here in the South of France, but one can eat like that while on vacation, right?) To us, the level of service and the accommodations seemed exceptionally generous but to the Austrians providing these, this was all very normal. Yet, I suppose one seeks different things from different places. For our Austrian sojourn, we were seeking greenery, alpine views, cooler temperatures and we were even open to some rain, and we got those things and more. In France, we look for different things. One isn't going to find the same kind of gemütlichkeit and good beer as in Germany or Austria, but here we have Paris, we enjoy wonderful food and wine, we have seen amazing collections of art. In the South, we appreciate the amazing climate and the wonderful Mediterranean. In the 18th century, Smollett was seeking a cure for his physical ills, and despite his negative experiences at the French inns along the way, he was restored by his stay in the South (he stopped in Nimes, Montpellier and ended up in Nice). 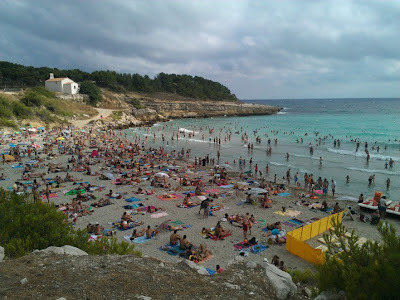 Likewise, while we certainly enjoyed our brisk and uncrowded alpine lake swim in the Austrian alps the week before, we continue to seek the pleasures provided by the turquoise seawater, the warm sand, and the beach atmosphere of the Med. So do thousands of others who visit our part of France each year. 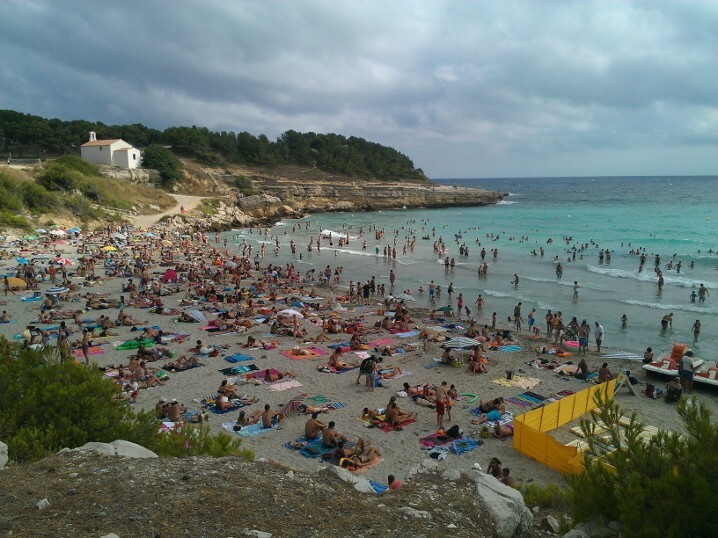 Here is a small portion of them at the beach at Ste Croix near Marseille this past Assumption Day (August 15). Smollett, Tobias. 2010. [1776.] Travels Through France and Italy. London: Tauris Park Paperbacks.